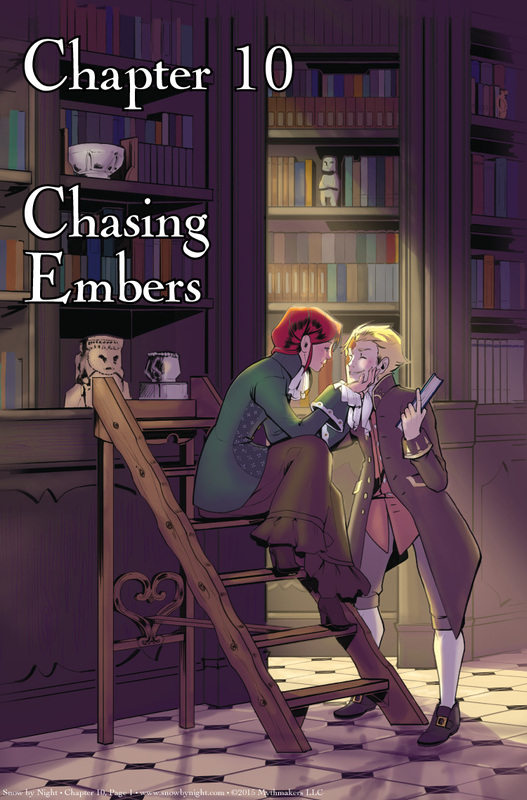 It’s a new year and we begin a new chapter — Chapter 10 Chasing Embers. In this chapter, Vivienne moves into the main cast. She becomes a force to be reckoned with in our story as she steers the course of events in Sherbourg. However, before we get to her, we have some unfinished business with Blaise and Snow-by-Night. See a preview of what they’re up to when you vote for Snow by Night on Top Web Comics. One thing I’ve learned about my artist Julie. She loves symbolism and she really packed it into this shot of Jassart and Cienan in the library. Vivienne’s gesture epitomizes her feelings toward the pretty commoner boy, while Jassart smiles at her with his eyes closed. Read into that what you will. Vivienne is higher than Jassart but only because she’s on a ladder. She is noble, after all. She has to sit down to reach Jassart. There’s a few other things that Julie tucked away in there. I’ll leave you to find them. Some of them won’t be apparent until later in the story. Speaking of symbolism and literary constructs, I hope you enjoyed the foreshadowing in Winter Fantasy. A lot of Blaise’s tale is hinted at in there. And gosh, golly, guess who the artist is for that vignette. You forgot to mention her excellent use of light. Very glad to see you back, and still impressed and amazed by you and your work! 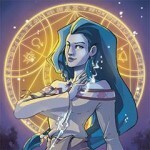 Will you be at GenCon in 2015? I’m expecting to be there in Author’s Avenue with Volume 2. Welcome back. Looking forward to the next chapter. Didn’t there used to be a donate button here somewhere? Fantastic comic, thank you so much! Looking forward to supporting the Kickstarter. I expect to watch Vivienne’s and Jassart’s romance with the same fascination that an impending trainwre4ck engenders. I trust that Vivienne’s good sense will make her see through Jassart eventually. Mind you, the romantic in me wonders if Jassart might have a major attitude adjustment before that happens, but on the other hand, it also makes me pity Jassart’s old girlfriend, apparently dumped when something better came along. On the third hand, maybe she’s better off without him. Jassart is such a scuzzbag that he really doesn’t deserve winding up with any friends, girl- or otherwise. Agreed. Anticipation, yet also that feeling you get in your gut right before you face scrunches up.